Refrigerators are for use in nonhazardous environments. Our refrigerator line offers undercounter refrigerators and upright refrigerator models. 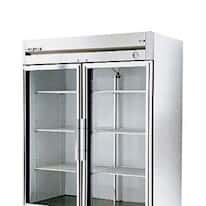 General-purpose laboratory refrigerators are for general chemical and consumable storage. Safety refrigerators are available in either flammable or explosion-proof models. Flammable regfrigerators insulate the storage compartment from electric sparks. Explosion-proof refrigerators are for use in locations where explosive conditions may exist external to the unit. Chromatography refrigerators are ideal for chromatography experiments and storage. General-purpose and safety refrigerators are designed to include two different environments for your cold storage needs. General-purpose refrigerators are for general chemical and consumable storage. Safety refrigerators are available in either flammable or explosion-proof models.